W Dia . Tol . ID Tol . 011 .070" ±.003 .301" ±.020"
034 .070" ±.003" 2.114" ±.030"
111 .103" ±.004" .424" ±.020"
137 .103" ±.004" 2.050" ±.030"
155 .103" ±.004" 3.987" ±.035"
174 .103" ±.004" 8.737" ±.040"
235 .139" ±.005" 3.109" ±.030"
251 .139" ±.005" 5.109" ±.035"
258 .139" ±.005" 5.984" ±.040"
271 .139" ±.005" 9.234" ±.045"
277 .139" ±.005" 11.484" ±.050"
These gaskets are a one-on-one replacement for military “AS” series o-rings. The dash numbers of the gaskets in the table are dimensionally interchangeable with AS568 o-ring dash numbers. Custom size o-rings are also available. Please refer to Custom Gaskets for more information. These o-rings are made out of our standard force Enduro-Shield or Flexi-Shield gasket material. The solid core or tubing makes it extremely durable, especially in sliding applications like connectors. 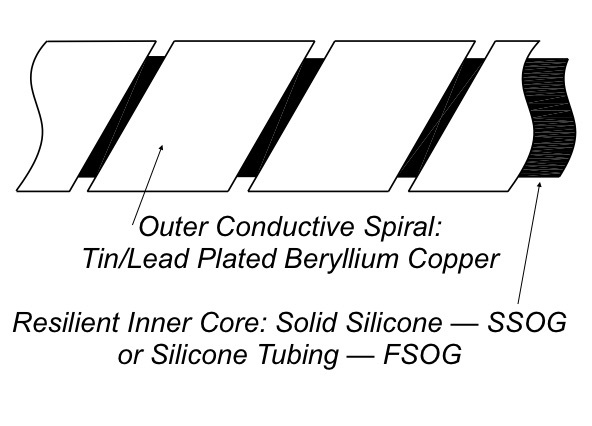 Spiral: Tin/lead plated beryllium copper. (See Options for RoHS compliance). Core: Flexi-Shield: 35 durometer silicone tubing. Enduro-Shield: cured silicone adhesive. Enduro-Shield or Flexi-Shield O-Rings offer shielding quality from 116 dB to 152 dB. The shielding quality of each type may vary depending on your specific application. Enduro-Shield or Flexi-Shield standard O-Rings require approximately 30 pounds per linear inch to compress properly. Optimal compression of the gasket is 25% of the diameter of the spiral. The gasket is electroplated, 90% tin, 10% lead (edges unplated). The core for Flexi-Shield O-Rings (FSOG) is commercial grade silicone tubing. Fluorosilicone is also available by request. The standard core for Enduro-Shield O-Rings (SSOG) is silicone. Note: An EMI/Environmental O-Ring is in development. Contact us for details. O-Rings are ordered by the piece. Custom sizes are also available. Not all configurations are stock items. Contact us for availability.